I don’t remember who the sage was, but he had the most obvious secret for success and happiness in life. It has become known as the Zen or Unix Philosophy. Anyhow, he said, “Do one thing, and one thing only, and do it well.” We instead have always taken the ‘Jack of all trades and master of none’ approach, and, yes, it is a source of constant frustration and conflict. One example is our preparation for any trip. It has to be closely akin to getting a Barnum and Bailey show on the road. Nothing can remain where it is designed and intended to be, because something else has to go there. A is moved to make room for B until A is needed, in which case B is moved to make room for A, or maybe C, like the toolbox, which is carried for emergencies and repairs. There is no telling when the toolbox will be needed, but when it is needed it is inaccessible because it is behind B, or A, depending on which took precedence in the last shift of supplies. So, the stuff stowed permanently in the truck is moved into the RV to make room for the things normally stored in the garage which must now go in the truck in place of the things in the RV. 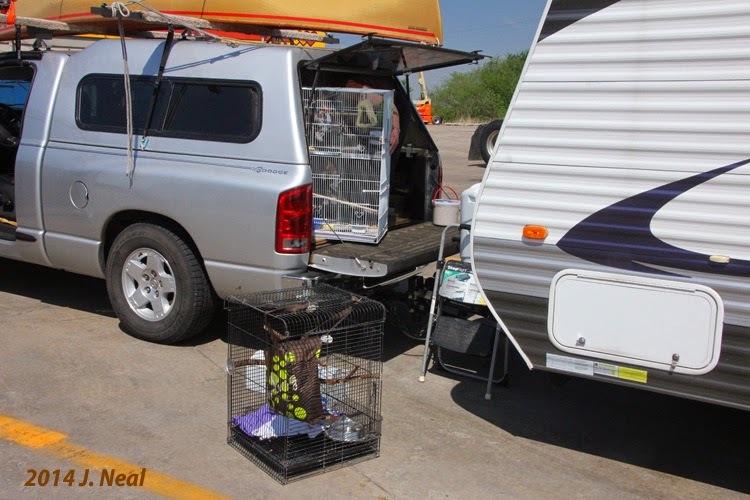 The things normally stored in the truck are there to prevent the possibility of arriving at a paddling launch site and realizing a vital item is back home. It now gets left behind and dozens of miles away in the RV. See how much better that is? 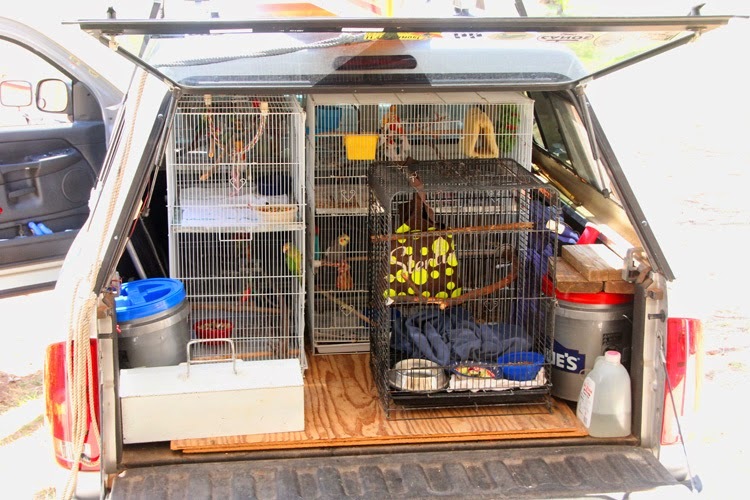 Before the truck is backed and hitched to the RV, two cats are put in the RV, then a cage of nine orphaned squirrels, that Jean is hand raising, is loaded into the back of the truck, followed by six caged birds. Along with their four buckets of feed and water bottle, that fills the truck. Doing the truck stop shuffle. All is hunky-dory until one of the birds starts screeching, which immediately calls for an urgent stop at the first truck stop to check on the birds and make sure all is still okay. Cages are unloaded or pulled and moved about until the offending bird, always one buried deepest in the load, is located and his peachy condition confirmed. Then all is reloaded and retied to return to a road-worthy state. To prevent wasting a stop, we top off the truck’s fuel and our coffee, and head for the highway to get the wheels turning again. All we need now is a big top, an elephant and a couple lions.